There are only three conditions that can occur at impact. The face of the putter is either open, square or closed to the putter’s path. The number of face angles and paths to make up these three conditions are however infinite. Putter face angle and path at impact are the two factors that determine the direction the putt will start in. The more important of the two is putter face angle. 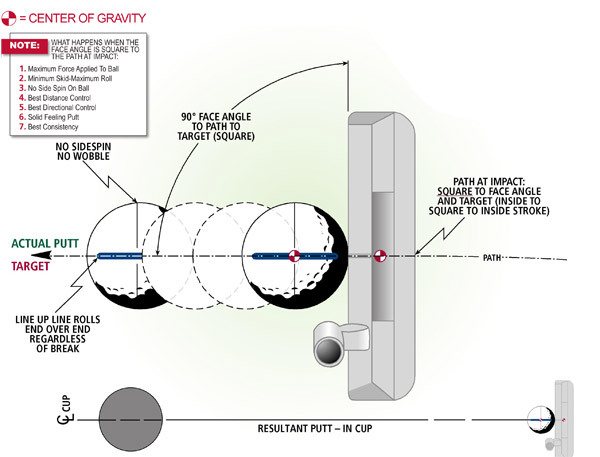 The breakdown is that approximately 85% of the balls initial direction is determined by the face angle at impact and only approximately 15% is a result of the putters’ path. The two together determine the direction and also if there is any side spin applied to the ball. It is always a good idea to draw a line on the golf ball and to align this line with the direction you want to hit the putt. The line on the ball will only roll perfectly end over end (regardless of the break) if the face angle and the path are square to one another. It is important to note that because a putt rolls true with no wobble, this does not automatically make it a good putt. The object of putting is to start the ball exactly on the desired line and with no side spin. So, if the putters’ face angle at impact is 1° open and the path is 1° inside out, the impact satisfies the square condition and has no side spin, however the putt will be started 1° to the right of the desired line. A ball started 1° to the right will miss the hole on a 7’ putt. If the putter face angle was 1° open and the path was 0° (square), the putt will still miss. However, if the putter face angle was 0° (square) and the path was 1° inside out, the 7’ putt would be made. The ball would have a slight wobble but this would hardly affect the putt. The slight wobble or side spin on the ball is a minor factor in directional control, but it is a factor. Remember that the amount of wobble needs to be evaluated and corrected if it is more than slight. If the line drawn on the ball rolls perfectly end over end it tells the golfer that he has aligned the putters’ face angle with the putters’ path angle exactly. 1) They impact the ball consistently in about a ¼” circle on the putters face. 2) They have developed the skill to align the putter face angle to the intended line by less than ½°. 3) The path is also aligned to within ½° or less. This sounds easy but if you get out some impact decals to test where you hit the ball on the putters face you will probably be very surprised at your lack of consistency and especially so on the longer putts. If you want to check your face angle to path consistency, putt the same straight 10’ putt with the same golf ball. This means you need to set up for the putt each time. If you can make 9 out of 10 putts consistently every time, this means that you are controlling the face angle and path well enough to start the putt to within 4/10th of 1° or less than ½° from the intended putt line. This is a very good start to becoming a world class putter but as we all know there are a few more skills that are also very important in putting such as distance control for example.